The world’s first folding game timer. The DGT Travel Timer replaces the DGT Pocket Timer. 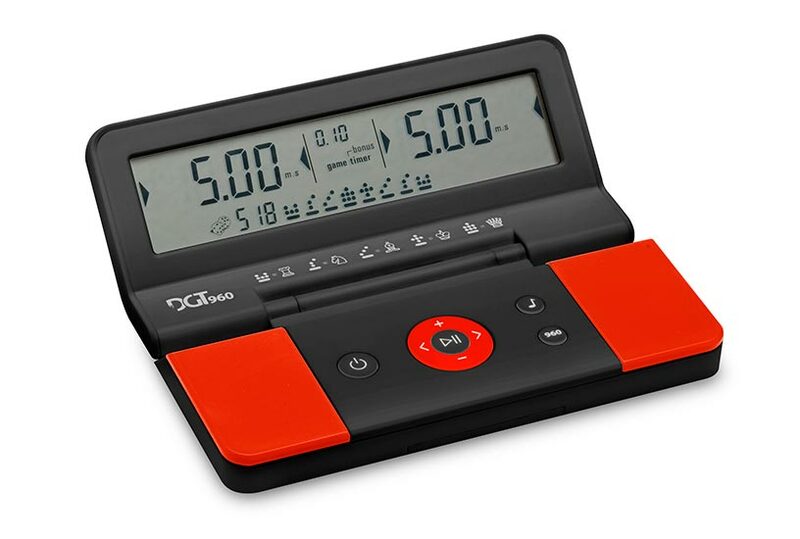 The DGT960 has all the great functions of the DGT Easy PLUS – including delay and bonus modes – and it also has a one-button function to quickly, easily – and randomly – create "Chess 960" positions. Now everyone can play the newest and popular variation of the royal game (also sometimes called "Fischer Random" chess after the late American champion’s efforts to promote it) without having to worry about how new starting positions can be generated. Folded, it measures a mere 5½" long, 2-5/8" wide and 1" high! However, it still "plays big" with a display measuring 4¾" x 1".